GOLD APOCALYPSE: I Smell A BOTTOM! One thing you can be sure of is that WHEN the positive triggers, impacting the rally performance of both the USD index against other major currenciesand precious metals, and the performance of U.S. stocks against bonds, will be finally exhausted and worn-out, the bounce in prices, which will be exhibited by gold, silver, and several other key commodities, will be magnificent. Since 2011, gold mining and natural resources, in general, have been one of the worst-performing sectors of this recovery. For seven years, which is quite a long time, calling the bottom or predicting the reversal of the bearish trend for metals, has been foolish. In 2016, the mining industry enjoyed a phenomenal eight-month rally, which revived the hopes of investors that it was the beginning of a multi-year bull market. However, all it did was to act as a vacuum, sucking in funds. Since August of 2016, we have been trending down for north of two years, save for some rare cases of companies, which grew, in spite of the deteriorating fundamentals. Many have emailed us, asking for the reason for the horrible and horrendous performance in share prices of companies, run by management teams, which not only are well-proven and disciplined, but are actually DOING the right things, yet still see more selling than buying for their shares. It’s not uncommon to see even the most brilliantly managed businesses going down 30%-80% in these brutal bust cycles. Awareness of this reality is 90% of the solution, then, because we can prepare, hedge and react, accordingly. Today and on Tuesday, I want to show you several tactics and strategies that I’ve been using and perfecting over the past 18 years of investing and speculating, as well as to broaden your view, as to how much money can be made, WHEN the time comes to have exposure to real assets, the tangibles, again. Gold stocks are cheap, which no one doubts, from Wall-Street billionaires up to rookie investors. That is not the question that investors are asking themselves, when forming a decision regarding this sector. If cheap prices were all people cared about, Motel 6 branches would have a “No Vacancy” sign at all times, and all the 4 Seasons resorts would sit empty. There are countless failing restaurants, which offer the cheapest prices for food and innumerable furniture discount stores that don’t see retail customer traffic. Cheap prices are not enough to entice investors to shares or consumers to stores. Remember, gold stocks do not operate in the universe all alone. As investors, we must look at what’s called Total Return, because investors have many alternatives, which might not be as cheap, but might enjoy better growth prospects and lower risk profile than gold stocks. When you look at investments, this is the number that counts (Total Return). Then, you must judge two additional elements: (1) the risk involved and (2) the level of expertise you possess to assess the Total Return figure correctly. In other words, if you’re wrong, what’s the worst-case scenario? Valuation Upside: Compared with the historical valuations, W.W. Grainger was trading at cheap multiples, which indicated a 17% upside, on that basis alone. Earnings per Share Growth: This is the rate at which the business internally gets stronger. It is, then, manifested in higher dividend distributions, in accelerated capital expenditures, in making strategic acquisitions, in paying down debt, or in buying back shares. At the time, we estimated it to be 14%, which is pretty substantial. Add these three factors up, and you’ll get 33.8% potential Total Return. Remember, the S&P 500 has an average annual return of 8.3%, so we were looking at a stock, which is a component of the index, but had a 400% higher probable return. Today, due to Trump’s tariffs, this domestic stock has already doubled since our publication. Obviously, making the same Total Returns analysis today is different for it, then. The business is still growing, so the EPS is positive (the B column), and the dividend yield is positive (the C column) as well, yet the valuation upside (the A column) is negative, so adding the three factors up, generates a meager 3.2% potential return, which is barely meeting inflation levels. So, for new money, this is not a good trade. At some point, most of the stocks in the large indices, such as the NASDAQ, S&P 500, and Dow Jones, will become too expensive and offer too small of an EPS growth to justify a higher bid. This is when markets tend to peak. We’re not there yet because there are still, at least, 40 stocks that have a huge Total Return number, but we’re inching closer and closer. W.W. Grainger has been in business since 1927, dominates its industry, and has a simple model, so the risk was small at $175 per share, and I understood the business model. We made a 100% gain, which is outrageously solid for this short amount of time. When hedge funds, institutional money, and individual investors calculate the Total Returns figure for gold stocks, the (A) Valuation Upside is huge because the miners are cheap, but the (B) Earnings per Share Growth is negative, and the (C) Dividend Yield normally doesn’t exist. Put differently, investors have seen the management teams burning billions of dollars to grow their operations, but their efforts have mostly failed. Managements wanted to grow, but reality is that they have been drilling unsuccessfully, running unprofitable mines, or making overvalued acquisitions. 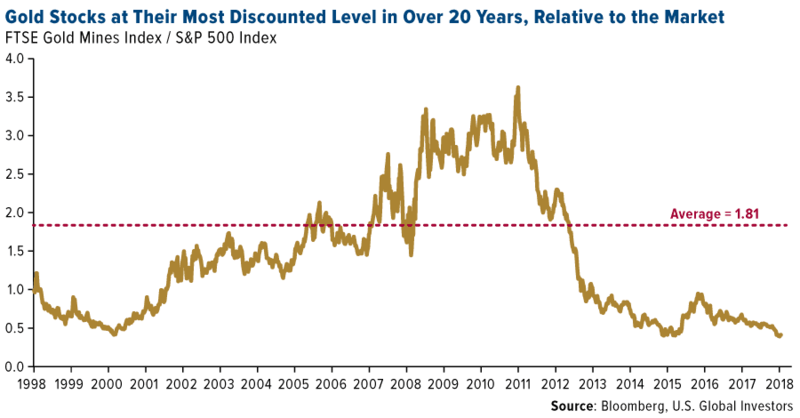 Even though the spot price of gold is up, since bottoming at $1,053 nearly three years ago, investors don’t see enough Total Return potential to justify the added risk that unpredictable commodity sectors inherently possess; they are shying away. So, three things need to happen in order to cause investors to enter the sector in droves because right now, it is so hated. Gold spot price needs to rise. This, of course, raises the value of the mines, the undeveloped assets, and, essentially, the entire value chain. The management teams need to make, what I call, Sure-Fire Bets. This means that we want to see the big miners, the billion-dollar companies either making acquisitions, which immediately add to their bottom-line or stop burning capital, by sitting on cash, without share dilution. This, of course, will raise the EPS growth prospects. Other investments will have to look pale in comparison. 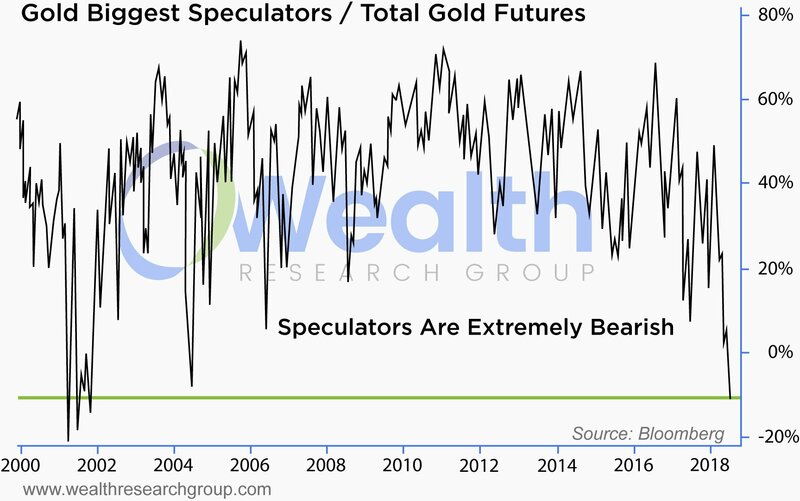 We already know that the gold spot price is down for the year and that the sentiment, as displayed above, couldn’t be more horrible. In other words, there’s a high probability that gold prices are close to their bottom for this phase of the cycle. Secondly, we just saw the biggest merger in mining history, with Barrick Gold buying Randgold Resources, creating the largest gold company ever. This is a positive sign, since it is the beginning of consolidation. However, we still don’t see a situation where other investments offer mediocre returns, because all U.S. indices are breaking records, trading at all-time highs, so gold stocks can remain cheap for a while longer, since investors remain bullish on the broad economy, for now. This Tuesday, Wealth Research Group will publish Part 2 of RISK-MANAGEMENT: OPERATING IN THE BEAR MARKET, where I’ll show you 11 strategies and tactics to use when investing in a bear market environment. Major BLOW: Critical DEEP STATE Update!